* This article is written by a Korean middle school student. There are many traditional things in Jeju we must preserve and pass on for the next generation and one of most important things is Haenyeo culture. Hanhwa Aqua Planet located in Seongsan-eup, Seogwipo City has the haenyeo show. The building is big and has diverse fish in transparent glass aquarium. During the show, trainers fed fish and the haenyeo demonstrated how they pick up abalones. It is amazing to see how a haenyeo can go underwater almost 10~15meters without an oxygen cylinder. People who was watching the show seemed to be surprised by the culture commentator’s explaination. Diving under the sea and picking up sea goods is called ‘Muljil’ meaning water works literally. Haenyeo usually starts to learn mulji when they were very younger. When they become adolescents, they are skilled veterans. 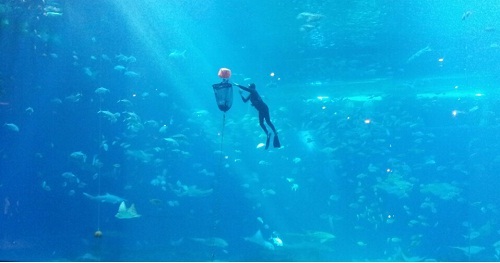 CEO of Sumbi, Lee Hanyoung, also runs haenyeo show in Hanhwa Aquarium. It is not only for shows but also showing their existence and promoting haenyeo culture. Now tourists can see how haenyeo works under the water, their abilities and also the values of their works. It is a quiet story how Lee started to work with haenyeos. Lee is an amateur scuba diver interested in swimming and going underwater. One day he found a person, haenyeo who can hold a breath for long without equipment. He was amazed by those people not breathing for 3 minutes. He thought they had special skills. So, he wanted to learn about it. However, he found out that there was no skill hidden. He finally learned the secret method for going underwater was love for their families. Haenyeo is a unique people of Jeju and has been a symbol to take care of her family. It is a very important value in Jeju to learn and pass on to the next generation.